Raffles Hotels & Resorts is a luxury brand with an illustrious history dating back to 1887, when the world-renowned Raffles hotel opened its doors in Singapore. Today, the remarkable collection includes twelve extraordinary properties in the world’s most exciting cities and top vacation destinations, including favorites such as Paris, Istanbul, and the Seychelles. 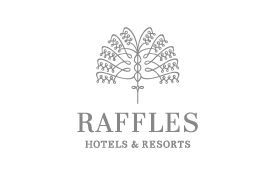 Whether it’s a secluded resort or a lively city center hotel, each Raffles promises an oasis of calm and charm and a compelling mix of cultures and styles, and each has its own story to tell. Earn Miles when you stay at Raffles residential sanctuaries, each one a landmark in its location.